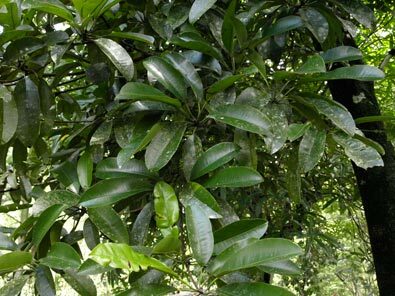 (A hardwood tree, possibly a species of Planchonella (Pouteria), Sapotaceae). 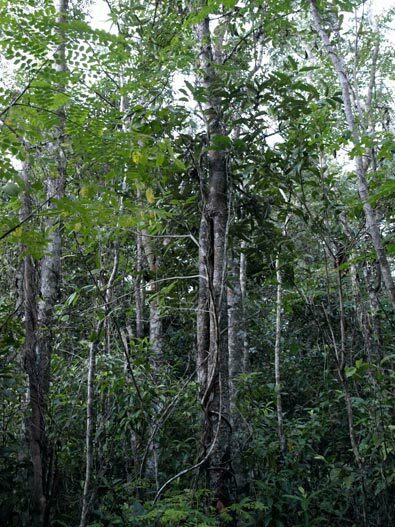 From PROTO OCEANIC *bau, a general name for hardwood trees in the family Sapotaceae. Samoan: Manapau (Mammea glauca, Clusiaceae). though the tree is said to grow nowhere else but on this peninsula. 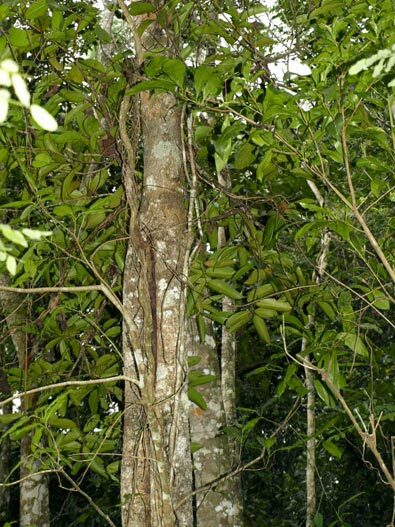 This tree is the Pau, Manilkara samoaensis (in some works referred to as M. hoshinoi), renowned for its very hard and durable wood. That quality is also reflected in its New Zealand namesake, the black maire, Nestegis cunninghamii. Although in Aotearoa was given to a tree from the olive family, rather than one of the Sapotaceae, the quality of the timber and general appearance of the tree and its fruit are reminiscent of its Samoan counterpart. 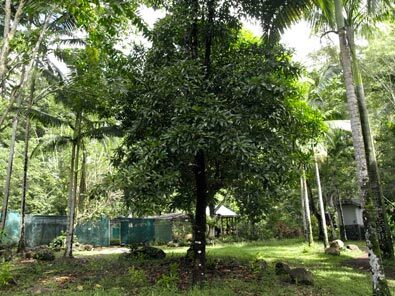 I was able to take the photographs on this page on a visit to Samoa in July 2015, in the Botanical Gardens in Tiapapata, Upolu, and also in the tree's natural habitat, the forest in the Falealupo district at the westerm tip of the island of Savai'i. The label for the specimen in the Botanical Garden notes that it is "Best wood for making axe handles and staffs". The inset shows a ceremonial fly whisk and orator's ceremonial and walking staffs made from pau wood, which I was able to photograph in the village of Neiafu, Savai'i, thanks to the kindness of our host. Further information : (See the books by Art Whistler on Samoan Rainforest Trees and Plants in Samoan Culture, publication details in the Bibliography).